Flying has always been a dream for man, but today the opportunity to live that dream is available to most people. 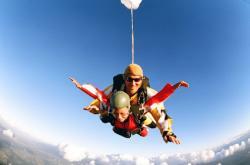 Britain is home to a myriad of opportunities for the airsports enthusiast, or even those just wishing to give it a try. Everything from the tranquil and yet exciting pastimes of gliding or ballooning, to the much more extreme experience of skydiving, are all now well catered for. Airfields all over Britain, many of them former military bases, provide the opportunity to try your hand at flying. Most flying and gliding clubs offer ‘starter experiences’ for those who wish to taste and try before they sign up and join an established club. Hang-gliding, paragliding and paramotoring have gained popularity and nowadays you are unlikely to live far from a venue or club specialising in these adrenaline boosting sports. Flying micro-light aircraft has also caught the imagination of those brave enough to take to the air in the modern versions of those pioneer aircraft. While modern technology and materials have greatly reduced the dangers of taking to the air, safety is obviously paramount in airsports, as in any potentially dangerous sport. You must make sure you choose properly organised and accredited clubs and facilities. You should also be sure to get the correct equipment, especially safety gear.